I will show you how to use 2 most popular recipes to develop BW film in this post. First we will use TFX-2 and later a variation using Rodinal. If I can learn and master this, I can bet anyone can too! Ok I stole Larry Wall's line for great programmers but it does apply to the new generation film shooters. We are all lazy - who wants to spend the whole day developing film? We are the instagram filter generation and want to see results fast. We pride ourselves in doing equal if not a better job at getting results quickly, efficiently and with velocity. Naturally I wanted to bring you a few pages from my personal film diary which today contains my BW film development recipes and tips for someone who does not have or want to spend a lot of time in the darkroom - heck you don't even need a darkroom, just a film changing bag. There are a few steps i mention below that seem laborious - but believe me, they are not! They are the easiest and most enjoyable of the entire process - well shooting I will give it to you probably is the best fun, but the joy of creating a negative with your own hands using chemistry you cook is next to nothing. In this post, I will break down my process in the hope that you will be able to follow a pattern to create a successful and repeatable BW workflow. Follow the steps and you should get a nice negative with good contrast ready to be scanned or enlarged/printed in a darkroom. (1) Find a developer of choice and dilute it heavily and increase the development time to around 1hr (well it varies between 30 to 90mins for most cases). (2) At the end of development use a water bath to stop development (provided you use a specific type of fixer, more below). (3) Fix the negative with a fixer. (6) Hang the negative to dry. That are steps you will follow to develop your BW negative. I personally prefer stand development because it allows the shadows a good amount of time to develop while the highlights do not get over developed. If you are new to this whole game, some background info is in order. Instead of reinventing the wheel I will point to a few blogs that will be great to read and get ready. (1) Film Development Basics - This is an excellent post for beginners. I highly recommend reading it more than once to get the fundamentals right. (2) Basics of Stand Development - A follow-up to the above, this post takes the reader into the philosophy of stand development. Note that from a purist's perspective, stand development is with no or minimal agitation. You add the developer, maybe do a few inversions, knock off the air bubbles and then just leave it for the time allocated. No inversions or agitations at all. I have done this with Rodinal 1:100 with good results but I like what is called semi-stand development which involves adding a few more agitations to feed the highlights. My recipe below explains it all. 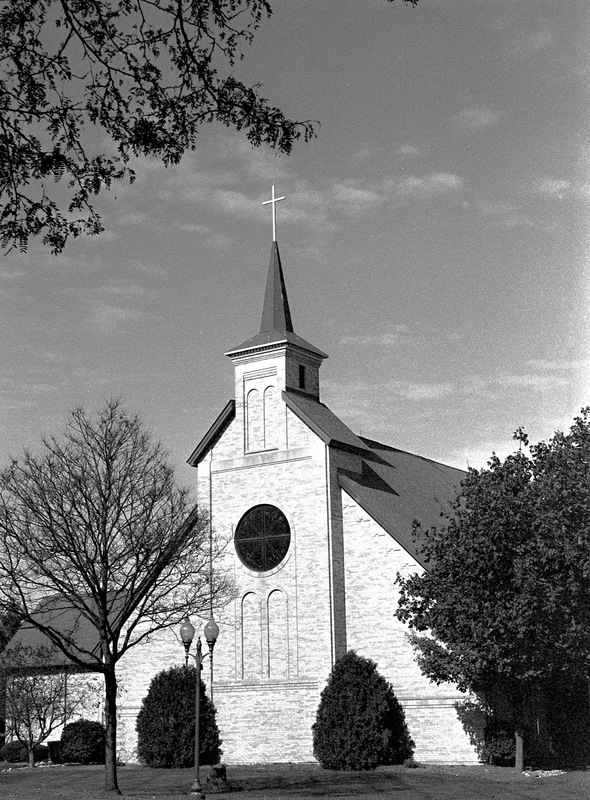 Photo of St. Peter Lutheran Church in Schaumburg IL shot on Leica M-A and Lux 50mm with Agfa APX 400 and developed using TFX-2 as per recipe in this post. (1) Developer is Photographer's Formulary TFX-2. (3) Fixer is Formulary's TF-4/TF-5 rapid fixer. A note about fixer. If your fixer is not fresh, you will not get good results. Even though you can reuse your fixer, I use it as one shot (which means I dispose the fixer and use a new one every time I develop new rolls). And if you develop a lot of film it may make sense to reuse. I do not develop a ton so always use fresh chemistry. Also note that the fixer when disposed should NEVER be drained into the sink. It has dissolved silver and it is really bad for the environment. Please check your local county or city guidelines and take the fixer to someplace that knows how to dispose heavy metals and harmful chemicals. Usually a quick google should get you results for your location. Coming back, I use TFX-2 and I am happy with the results. Since I adopted the semi-stand development technique I am achieving excellent results every time. You will be spending 30 minute total developing time. Dilution will be 1:1 @ 68F. 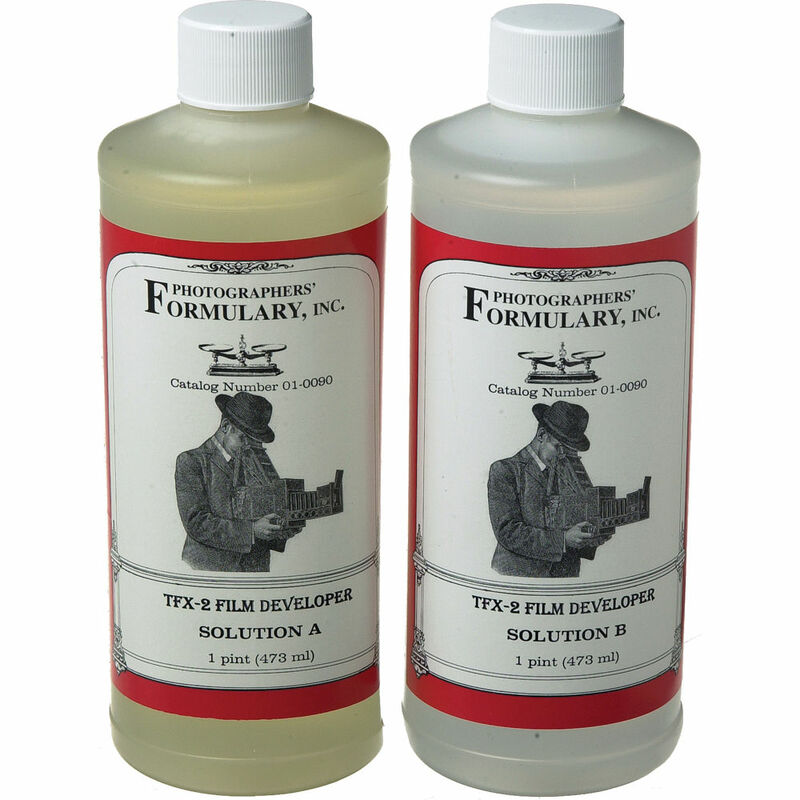 (Mix 12.5ml Sol A +12.5ml Sol B to 475ml Distilled water to get 1:1 dilution and 500ml working solution of TFX-2) - This is NOT mentioned in the instruction sheet that comes with the kit, but from my cheat sheet. I use the Paterson super system 4 tank that comes with 2 reels. I use very gentle agitation, 4 inversions take approximately 20 seconds. If you can hear the air trapped in the funnel of a Paterson tank sloshing the developer, you are inverting too quickly. After each inversion I rotate the tank 90 degree so that all areas of the film receive the same degree of agitation. Usually temperature of developer and water is of not super concern in stand development but I usually keep them roughly at 68 degree F which is fairly easy to achieve. Don't worry about keeping the temp at 68 all throughout the development. I just try to get everything at 68 to start and then not worry about it during the process at all. 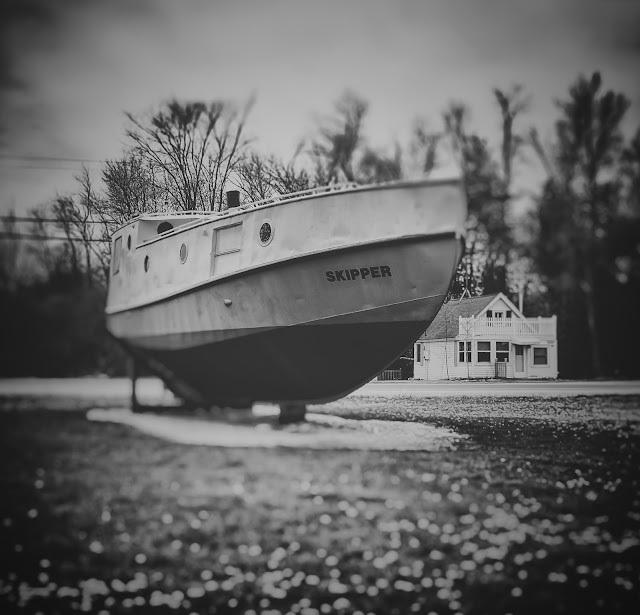 Wisconsin Maritime Museum in Door County shot on TMax 400 with Hasselblad 503cw and Zeiss 80mm. Developed using the TFX-2 recipe. (7) Drain tank after 30 minutes of developing time. (8) Use a 2 minute running water stop bath. (9) Fix with TF-4/TF-5 fixer. I have used the above method of developing successfully on the many films - Tech Pan, FP-4+, Delta 100, T-Max 100, Agfa APX among others. Based upon my experience TFX-2 works equally well on both conventional and T-Grain films. I like the overall print quality much better than prints made with negatives developed in my previous developers like D-76 and X-Tol - but that comment is strictly in the context of stand development. But the scene and subject you are shooting is of course the primary decision point on what type of developer you use. That discussion is fascinating and I am going to write about my experiences with solvent/non-solvent/compensating developers and the effect on darkroom prints eventually. But that is a discussion for some other time. Let me know how it goes and hope this helps! If you are using Rodinal, the whole process is much simpler and closer to a traditional semi-stand development. Developer is Rodinal and dilution is 1:100 (that means 1 ml of Rodinal for 100ml of distilled water). We will use 500ml developer which means 5ml of Rodinal for 500ml of distilled water for one roll of 35mm or 120mm film. Remember, developers like Rodinal are extremely cheap and hence do not cut corners by using less amount of developer per film roll. You will always see better results by using more developer. Usually you can get away by using 300ml of developer after dilution but I always use 500ml/roll. (1) Presoak for 3 minutes in water and then drain. (2) Add 500ml of developer to tank. (3) Agitate for first 30 seconds (4-5max) and leave the tank untouched some place. (4) Agitate 2 times at 30 minute mark. (5) Leave it for another 30 minutes and you should be done. (3) Drain tank and use a 2 minute running water stop bath. And fix with TF-4/5 fixer. Wash normally.